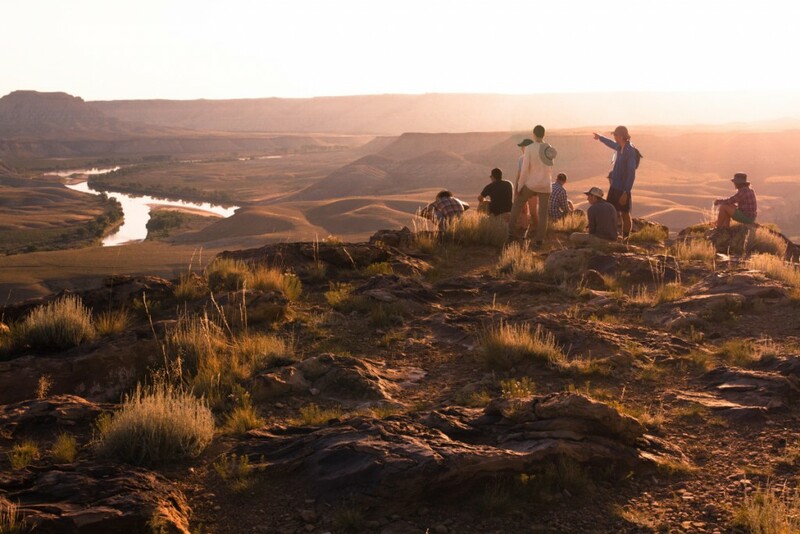 In 2018, NOLS instructors took their professional training to the heights of Washington and Alaska, to rivers around the world, and to the hills of Wyoming, on both wilderness expeditions and frontcountry trainings. When you read their stories, we hope you're as excited to dream about your next trip as we are! (Brett writing): We attempted to climb the East Ridge of Mt. Logan in Canada’s Kluane National Park. 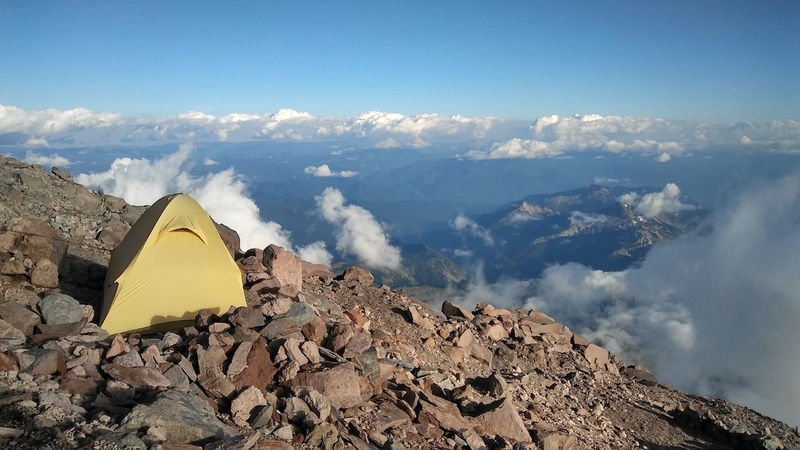 We spent 18 days on the mountain, and climbed to an elevation of just under 12,000 feet. We traveled on glaciers, climbed an exposed ridgeline, and hunkered through storms. Due to a combination of stormy weather and time constraints we weren’t able to summit, but had a great time and learned a lot. Greater mental and physical capacity to teach and support students in a way that helps them gain more from the adventure. Exploring mountains is one of my main passions in life. Personal trips like this one fuel that passion, which I am able to share with my students. The variety of rope systems that we employed to move through exposed terrain will help me to choose the lowest risk and most efficient system in the future. Commitment to the team is far more important than commitment to your goal. This trip reinforced for me how important it is to be fully committed to your teammates on an expedition. While it was disappointing that we weren’t able to wait out the incoming storm and try to summit later, I understood how important getting back on time was so my partner could catch his flight home. I was happy to make a decision that supported him, favoring our friendship and agreement to each other over a chance at summiting. I think that is an essential attitude to have on any expedition. 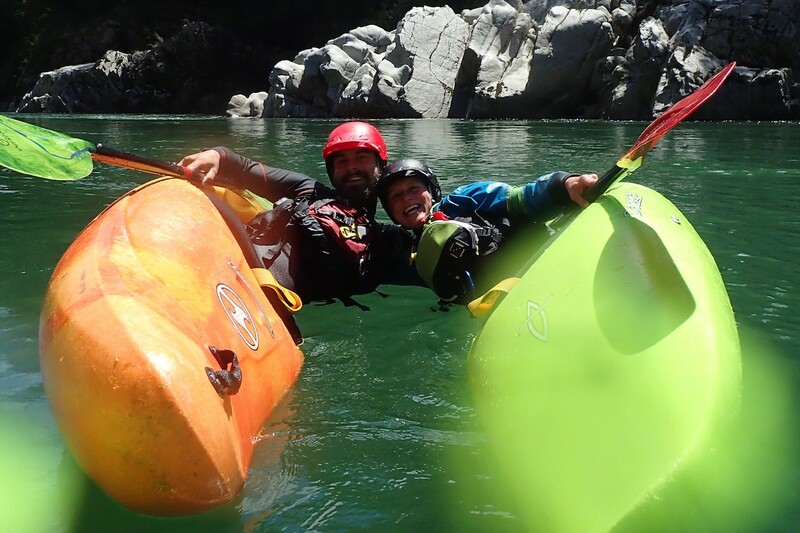 Dana and Nic spent four days in Murchison, New Zealand, training with the New Zealand Kayak School on the shores of the Buller and Matakitaki Rivers. From morning to night, they were immersed in whitewater kayak instruction: gaining more effective rolls and trying different styles, more advanced techniques, and honing their river-reading skills in Class 2-3 whitewater. The days were long, but the stoke was high, and thankfully the weather held out (mostly). Mornings were spent practicing in a local pool with one-on-one instructor coaching, breaking down the intricacies of a sweep roll step-by-step, and later, throwing in some hand rolling as well. Students were video-taped so they could identify firsthand what worked and what didn’t. In the afternoons, the groups moved to outdoor rivers to put those morning sessions into practice. Both Dana and Nic felt big improvements by the end of the course, and were ready to spend another week in Murchison on their own, paddling each day and practicing their rolls every chance they got. The amount that Dana and Nic learned over four short days could fill the mighty Buller River itself. From hard skills to improving confidence on the water, they walked away from the experience ready to apply what they had learned to their personal boating, both in kayak and canoe. 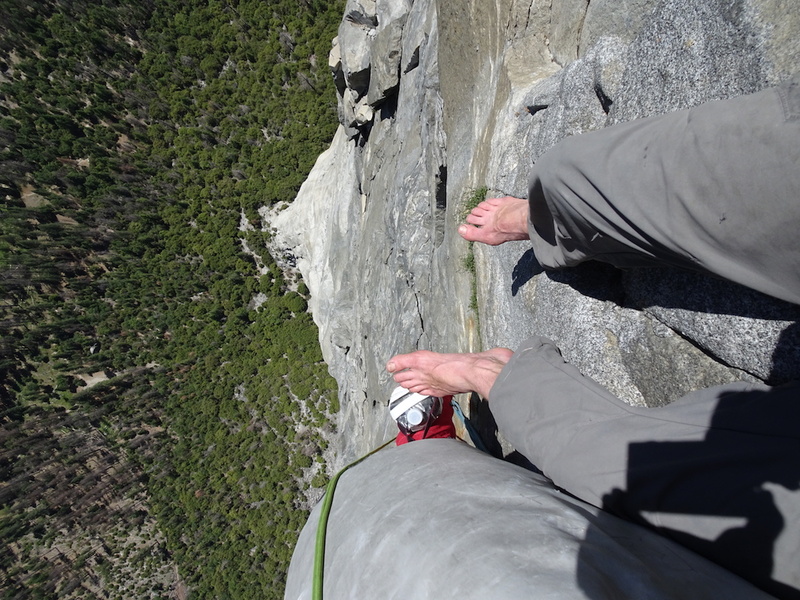 (Joe writing): Henry and I went to Yosemite Valley to climb The Nose, a big wall route on El Capitan. The Nose has 31 pitches and 2,900 feet of vertical gain. We planned three weeks for our trip to account for both time on the wall and potentially uncooperative spring weather. This was my first attempt to climb a big wall. My goals were to improve my ability to problem solve in an extreme environment with time pressure, physical fatigue, and many other subjective and objective hazards. This required using 12+ years climbing experience and a broad range of technical skills transferred to a completely new environment. Getting to experience so many iconic pitches—Texas Flake, Boot Flake, The King Swing, The Great Roof, The Changing Corners. Waking up in a portaledge on the face of El Cap five nights in a row! Communication is key: Both while climbing, separated from my partner by 100 or more feet of howling wind, and afterward as we supported each other after mentally challenging days or pitches. Decision making: I learned how to better take into account as many variables as possible, and realized how wide-ranging these could be as I used that information to make a decision with confidence. In addition, knowing the micro and macro levels of decision making happening at all times. 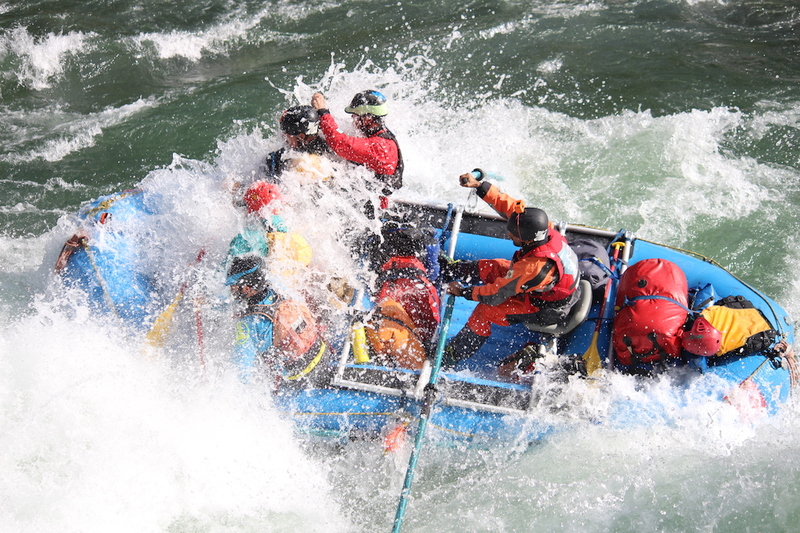 Further broaden and deepen knowledge at the NOLS River Base in swiftwater rescue response, and support the training and development of other NOLS River Base faculty both in seminars and during field contracts. Expand and refine my own repertoire in prevention and response, we workshopped progressions and selecting training venues for teaching the same skills. I was able to spend a lot of time learning from and with some of the top experts in the industry: Jim Coffey, a NOLS instructor and swiftwater instructor trainer for almost 30 years was being certified as an ACA Instructor Trainer. Also present were two ACA Trainer Educators, Robin Pope (past ACA President) and Sam Fowlkes (responsible for the initial training of a large proportion of current SWR Trainers). A second highlight was the huge range of perspective that participants brought to the training. They came from all over the country and with varied backgrounds, from owners of a rafting company, to private boaters, to university program administration. 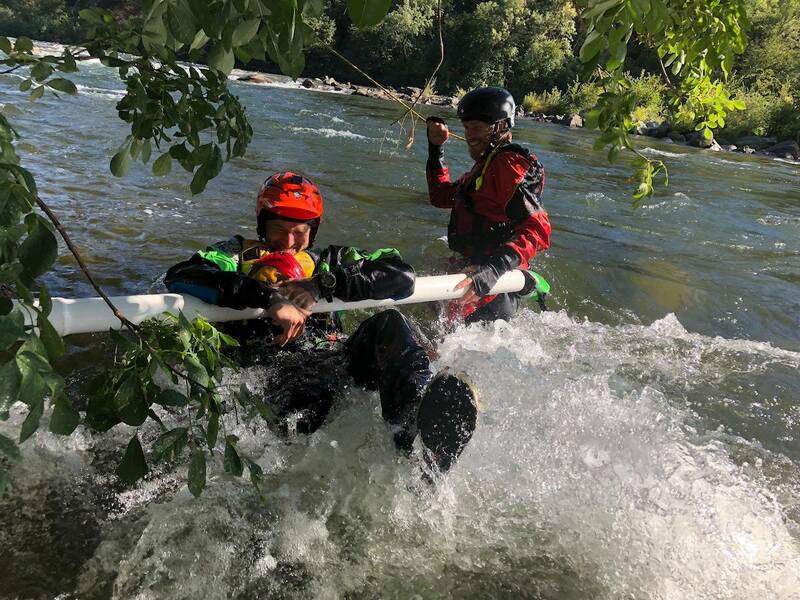 During the summer 2018 season I ran pre-course swiftwater trainings for my fellow instructors. 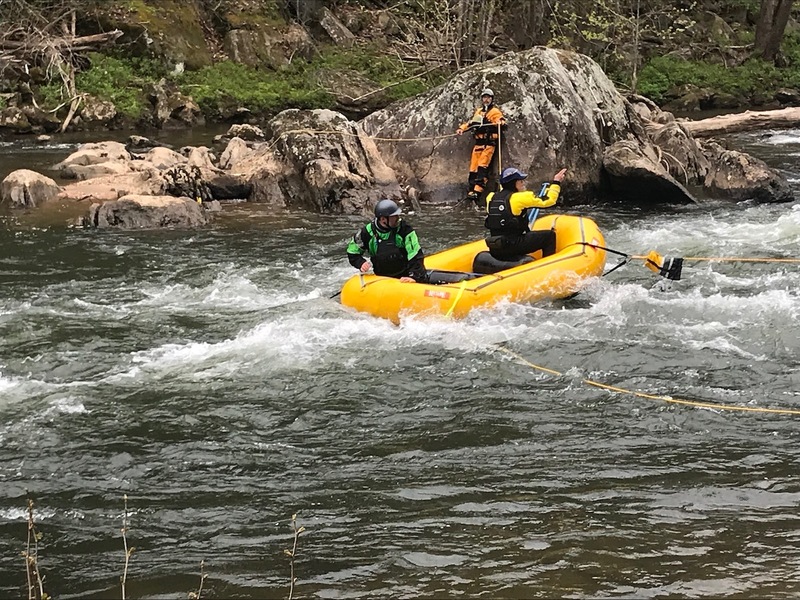 This set us up to provide an early and robust swiftwater curriculum for a NOLS summer semester course, making our student group very real assets in preventing and responding to river-related incidents. Invitations to train the staff of other organizations (including North Carolina Outward Bound School, and University of Maryland Outing Club), which gives me access to conversations about program and risk management practices outside of NOLS. I was also able to help participants become more comfortable with wading techniques that wound up becoming a course highlight with an Outward Bound group of American Explorers. (Darcy writing): Tim Parker and I spent almost a week climbing mountains in the Cascades. We selected two objectives: The North Ridge of Mt. Baker and the Kautz Glacier route on Mt. Rainier. We started on Mt. Baker. Late season conditions required navigating through large crevasses on both bare and snow-covered glacier, sometimes climbing into them and then back out. While we didn't summit due to the heightening overhead hazards and time, this attempt set us up soundly for our next objective: Rainier. We chose the Kautz Glacier route because it is the most technical route still manageable with late season conditions, offering a couple hundred feet of Alpine Ice III. The day after establishing our high camp, we headed onto the ice. The navigational challenge of weaving through crevasses ended up being the most time-consuming part of the climb. We wove through the maze on the Kautz Glacier, then headed onto the Nisqually Glacier. This necessitated evaluating and crossing many thin snow bridges, as well as down climbing into and out of crevasses. It was slow traveling, but we found a viable route to put us on the summit. At this point, as they say, we were only halfway done. We followed our tracks back, carefully checking that the changing conditions didn’t make any snow bridges impassable. Once at camp, we packed everything up and continued down back to the car—making for a very long day! 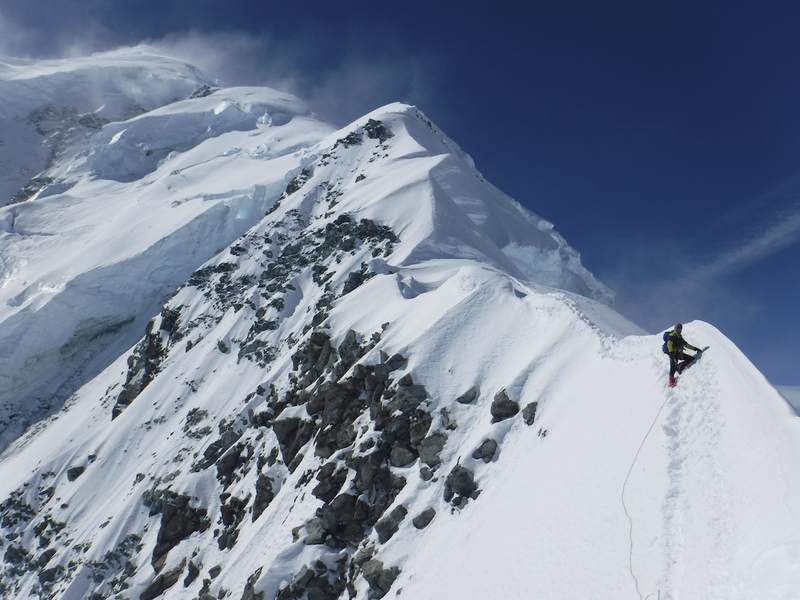 Our trip provided us the opportunity to connect many skills we had previously practiced – from ice climbing techniques and zero-threads to navigating large, broken glaciers. We are pleased with the opportunities we had managing some of the objective hazards in glacial terrain as well as the beautiful views from the glaciers of the Cascades. Practicing managing a "strainer." Photo courtesy of Sierra Rescue. Luis participated in a 2-day River Rescue Certification course through Sierra Rescue in Coloma, CA. This was an intensive and hands-on course where all participants were pushed to their limits of comfort. The main focus of the two days were prevention and awareness by understanding river hydraulics through scenarios, case studies, and practice. The scenarios included practicing river crossings, swimming, live-bait rescues, knots, throw bags, mechanical advantages, and wrapped boats. One of the best drills was the perfect strainer practice (pictured above). Participants floated downstream and mimicked getting caught on a “strainer” made of PVC. Even in a controlled environment with slow currents, it was still almost impossible to go over the PVC pipe, showing how dangerous strainers can be. This and many of the other drills were eye opening and gave Luis a different perspective about spending time in rivers. 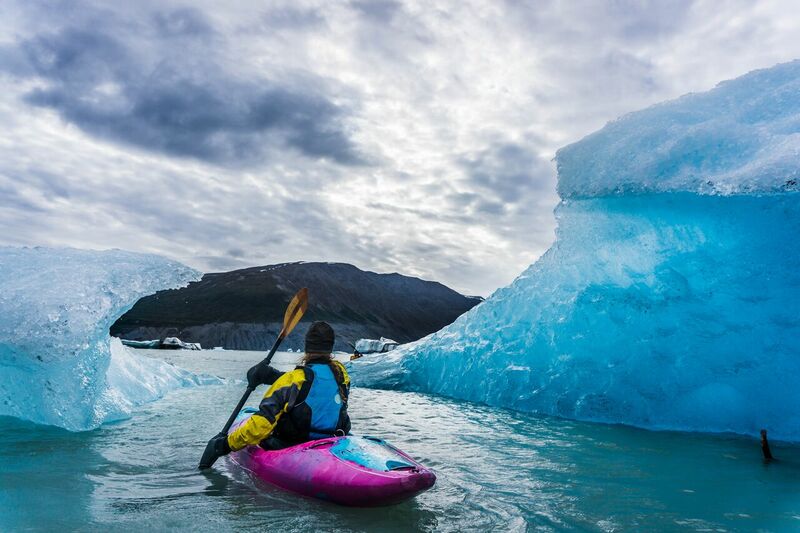 He is comfortable in various activities related to rivers, including teaching river courses, managing river crossings while hiking, and even working sea kayak expeditions. 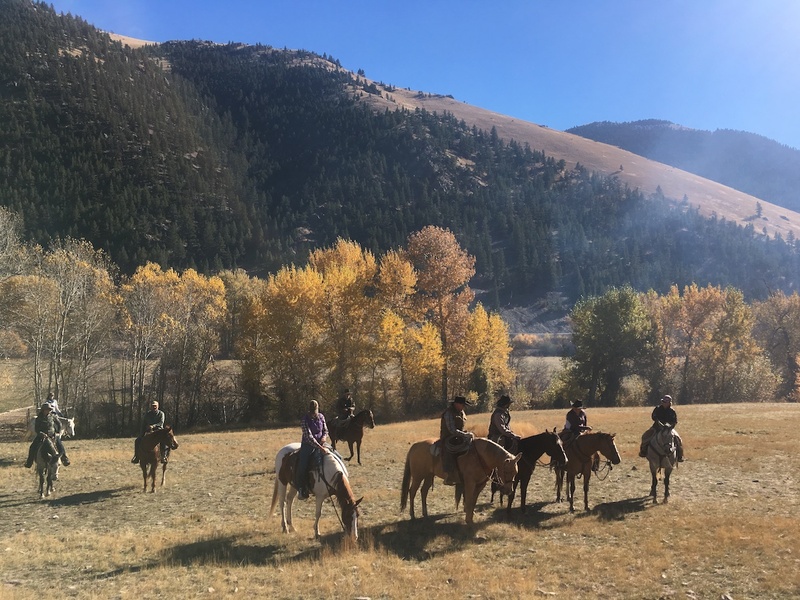 (Patrick writing:) Kelsey and I participated in a 6-day clinic with renowned horseman Martin Black centered on advanced horsemanship and stockmanship. Black promotes a vaquero/buckaroo type of horsemanship that can be traced back to Spain. It requires a high degree of excellence in both horse and human and is associated with traditional saddle and tack. It is also centered on stockmanship, which is to say handling stock (cattle) in a low stress and artful way. Each day started with a debrief and Q&A session with Martin. Most mornings consisted of drills on footwork, precision, and timing. The afternoons were often out in the surrounding pasture and hills. The culmination of the week was gathering and sorting pairs (cow/calf pairs), weaning yearlings (separating them from mothers), and branding 6 slicks (late calves) and a couple of other unbranded stock. We were in the full learner mindset (similar to how our students are) and were reminded that it’s tiring, intimidating, and often overwhelming to be a learner. It also requires some humility. We have more tools to explain and coach students on their horsemanship and technique. Do our students need to be able to stop in 3 paces from a trot with the back right hind foot forward? No—heck, we don’t really either. But we can give them some universal tips on a horse’s balance that can allow them to communicate more successfully. The importance of slowing down. Horses need a rest—humans too. When in a stressful situation, one’s ability to learn or perform to expectations can be limited. Maintaining perspective is a challenge, or as Martin puts it, thinking peripherally. You can never be fully prepared for something you haven’t done before. My horse, Rooster, did not handle the smoke and smell from a branding particularly well. How could we prepare for this? Well, we can’t, really. Instead, we can make it positive by returning to practice and drills that mimic other aspects of the branding (roping, dragging, tracking calves, etc.) and know that the next time won’t be as stressful as the first. 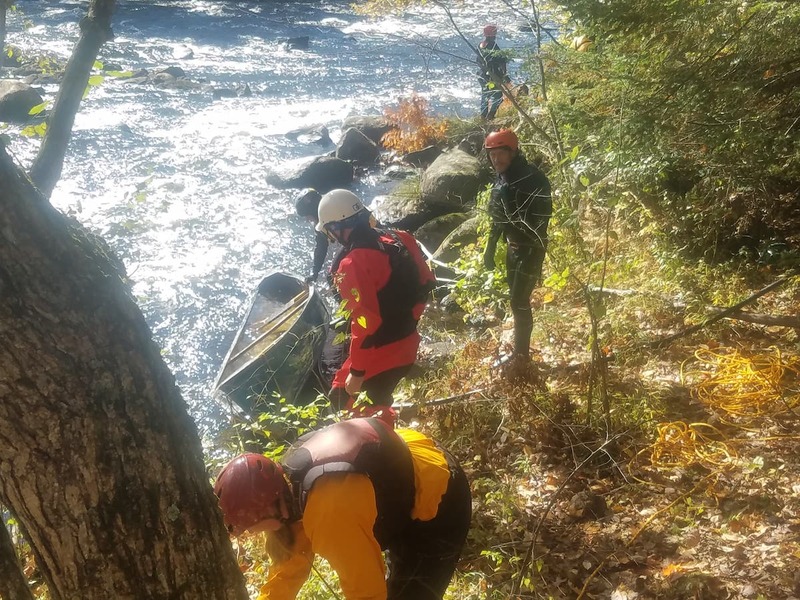 Last October I headed to Errol, New Hampshire to the Androscoggin River to participate in a 2-day swiftwater rescue course. It was a brisk fall weekend with vibrant yellows and reds from the almost peak foliage. Our first day was spent swimming rapids, practicing with throw bags, tethered swimming, and learning about different rope systems. The second day we did multiple scenarios, putting into practice what we learned the day before. At one point we pinned a canoe on purpose. It was fun to have to actually work through how we were going to unpin the boat and see the rope systems in action. One of the biggest takeaways was learning that getting hands on someone in a rescue is going to have the best results. Also, remembering to keep things as simple as possible, especially in an already dynamic environment. Overall, it was a great learning experience and I look forward to continuing to expand my knowledge with rescue techniques in the river environment. 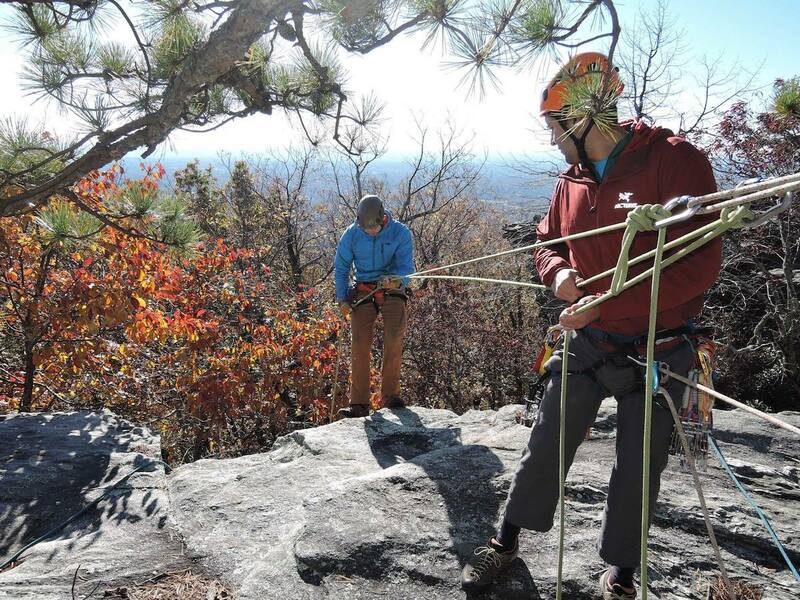 Leo attended a three-day Single Pitch Instructor Course (SPI) in North Carolina hosted by Granite Arches Climbing Guides. The course consisted of discussing and practicing professionalism, knots and hitches, teaching, managing climbing sites from the base and the top of the climb, and assistance skills. I ran in to Matt Moore, who had been on the same Wilderness First Responder course as me. We partnered up for a few activities together, and I was surprised that our limited time during the WFR helped us work so well together. I was pleasantly surprised to be able to set up the Joshua Tree System (V rig), the Lifeline System (V rig with Instructor Tether), and lastly the backside system. I had been exposed to them before, but never could do them without coaching. This time around, it all made sense so I could build them independently. I have struggled to ascend myself in the past with the ascension of a rope to practice a rescue. During this course Matt gave me some pointers that made the process for me much less laborious. I have been climbing recreationally off and on for a few years, and I want to obtain an SPI so I can share my experiences with future clients and students. The course felt like a great step where I not only learned, but also enjoyed the process. (Anvesh & Rick writing) The 2018 Kameng Expedition was a 14-day expedition in northeast India with five participants run by Anvesh's company, Expeditions India. It was my first time back on the Kameng after 10 years, so I got to see firsthand the development in the region. The Kameng River is located in the Northeast State of Arunachal Pradesh ("land of dawn-lit mountains") in India. Ten years ago, we traveled through land that was filled with wildlife and tribal communities. This time, we saw a lot of concrete buildings and trash, though fortunately the whitewater in the river corridor was still great and the forests there still untouched. Since three of the five participants were NOLS instructors (it was Rick who had the inspiration and motivation for the trip in the first place), I already had an intimate knowledge of their working styles and personalities. This made the trust level on the team on high, allowing a certain ease in dealing with the river expedition travel. As the designated leader, I could see clearly that NOLS’ 4-7-1 leadership model played into every situation. The Kameng River and the state of Arunachal are undergoing explosive changes. New infrastructure and government funding appear in juxtaposition to traditional lifestyles and a more remote existence, exposing a whirlwind of change. One mile reveals a community village with elders in historical headdress and woven backpacks and the next a group of women at a confluence grilling meat and dancing to modern tunes from a car stereo at a picnic. Finally, it was great to witness Gene’s progression. Both of us were instructors on his first Salmon River instructor seminar when he was just a beginner. On the Kameng, I watched as he confidently guided the raft on a new river, actively scouted and gave valuable feedback, and became the go-to guy for rope work. He even taught our staff team how to bake fresh bread, which was so delicious that it got written up in subsequent trip reviews. All of these instructors started learning somewhere—develop your own expedition and teaching skills on an outdoor educator course.